It’s not often we get blown away when we see a desi artist for the first time, and it’s even rarer that we’re left absolutely speechless. That is exactly what occurred when we heard the powerful voice and impressive delivery and presence of Svetha Rao a.k.a Raja Kumari. Paper caught up with Los Angeles based rapper who is signed to Epic Records – a republication of the article is below. All credit goes to Paper Mag. The very beginning for me would be classical Indian dance. My guru lived in my home since I was six years old and taught me for 15 years every day. I had a very unique opportunity to learn from the source. My appreciation of the culture came very early. I’ve had to remind my parents that they made me this vessel of art. There’s enough doctors and engineers in the world, and if I didn’t devote my life to [the culture] it might get lost. I was doing a lot of philanthropy work through my dance and I’d raise like $80,000 in a night from performance. I built a meditation hall in India with the proceeds. I was like 10 years old and I remember I sat in the hall and realized my art created a real thing. At the time I was also obsessed with pop stars and saw the platform they had. Indian people have never had that platform — [it was astounding to me] that Indian classical dance had never been seen on [a mainstream pop stage]. The most that’s ever been seen was in the Michael Jackson video for “Black or White” — where he had an Odissi dancer. There was so much pride after that. There were a few years where I was in the studio every day, sometimes laying down tracks twice a day. It got me a lot of placements. But I realized when you’re starting out in this industry you have to write songs for other people first. The record company wants you to know what a hit is before they put a million dollars [behind you]. After I got signed, I was just working on my album and Gwen’s. And, you know, for us, she was like the first person to bring Indian culture to the masses. I was going to ask you about that, what was it like working with Iggy and Gwen as someone who has devoted herself to preserving the culture? They’re like the ultimate cultural appropriators for South Asian stuff. I’m gonna tell you the truth, when I saw Iggy Azalea’s “Bounce” video, that woke me up inside. I thought I can’t keep writing for other people and allow them to exploit my culture. When I saw her wearing the golden kiritam [a crown-like headpiece], you know I wear a kiritam when I play Lalita or Saraswati or Lakshmi. But you’re Iggy Azalea, you don’t get to wear a kiritam without understanding what that is. It just woke me up, because I swear a lot of the details of that video I had written in my journal for years. I had wanted to do it. And then just seeing someone put on my culture like a costume, it was like “my culture is your gimmick” and I’m just not playing that way anymore. But you know with Selena and Beyoncé, I can’t blame them because we haven’t provided someone to teach. We haven’t given anyone an option of an Indian person up there in the American mainstream to expose the Western people to [the culture]. I know they’re infatuated and they’re interested, and I can’t blame them because it is beautiful. Indian culture is human culture it’s human history for all of us to share but you can’t pick up little pieces and not understand. What about your own appropriation? I see you’re wearing a grill in this music video. You know my label came back and told me my music video was too urban. But I don’t think hip-hop is only a black thing. The entire three months I was making this album I was across the hallway from Future. We’re on the same label. We talked about Indian culture and it’s crazy to think I influenced this man. He influenced me too. Future said “You should wear the Taliban rags and the gold grill,” so on all my album artwork I’m wearing the gold grill on the bottom. He gave me so much advice about releasing music and myself. He would say “we create the culture, the label exploits it but we have to do it ourselves.” You know, all of Future’s visuals for Summer 16 are Bollywood visuals. Do you ever have an issue with being forced into a mold? I’ve talked to other musicians and artists who don’t like being called a “brown artist” or a “Desi artist” because they find it limiting. What does that conversation look like for you? That conversation’s been had by my management about not being pigeonholed. But you know what I’ve come to…When it comes to me I’m just going to be me. And what I am is an Indian woman. And I’m very proud of my culture. I don’t think the novelty can wear off when it’s authentic. I don’t just throw on a bindi or bangles as an accessory to my outfit. I just think my face feels symmetric when there’s a bindi. Even when I’m laying down tracks it doesn’t have to be Indian because I am Indian. I always tell producers that just because I’m in the room doesn’t mean [the song] needs an Indian flute or tabla. I’m so Indian no matter what I do it’s going to sound rhythmic. I’m thinking of fusion in a different way – I don’t want to do what’s been done before by just recycling a Hindi song and just being a sample. 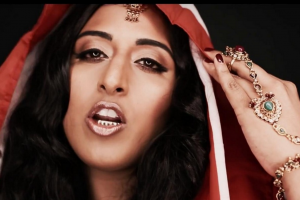 I don’t want to just say something in Hindi, I want to bring our ancient rhythms to hip-hop. I feel like some artists do that, like Kendrick Lamar — he’s rapping in tisra [a rhythm count from carnatic music]. I played him the album and he stopped it. He was like “This. This is new. Nobody in India does this. Nobody in the world does this. Do this.” Ever since he told me that I’ve been fearless. If this man reacts to this then that’s what the world will hear. Do you think you’re doing something big for Indian people? I want to be a role model for Indian kids who are trying to hard to be American. You know that day, when Miss America was crowned and she was Indian, I came to the studio with sweets like “Yo, laddoos for everyone, Miss America is Indian! The world is a different place.” I want to be that for others who don’t maybe have that role model. This interview was conducted by Nadya Agrawal for Paper, the original can be read here.